I have a new favorite pizza place. 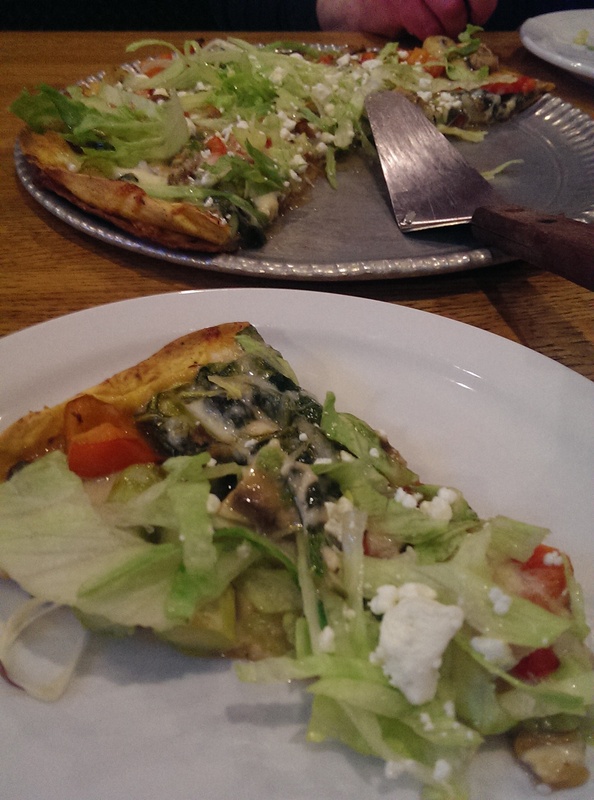 I have been hearing about Danny Boy’s Pizza since I lived on the West Side of Cleveland. It opened in Rocky River in 1991. I used to confuse it with Danny Boy Farmer’s Market in North Olmsted, which I used to drive by all the time on my way to work from Olmsted Falls to the Baker’s Square on Lorain Road in North Olmsted. I have been meaning to try the place forever and simply never got around to it. Well, I heard they opened a new location in Broadview Heights, and my best friend and I finally went there to check it out last night. My friend M. is a total mac-n-cheese freak, so when I told her about their mac-n-cheese pizza I knew she would be up for driving there with me. The location in Broadview Heights opened in mid-August in the longtime home of Pipers III, which closed its doors earlier this year after nearly 40 years in business. I’ve eaten at Pipers III, and I can’t tell you how happy I am to hear a restaurant closed. We used to have the annual meeting of our local translators group there, and I found the place really stodgy. They’ve done a nice job renovating the place. It barely resembles Pipers III – and that’s a good thing. The atmosphere inside the restaurant is casual. Lots of tile and booths and tables. A wood bar divides the more ‘formal’ dining area from the bar area. The walls are are covered in posters, fake road signs, etc. all featuring Rat Pack memorabilia. The voices of Dean Martin, Frank Sinatra and Michael Buble croon over the speakers. I immediately felt comfortable. The place was packed for a Tuesday night, but we were shown to a table immediately. The parking lot was still packed when we left an hour and a half later. Danny Boy’s is definitely thriving at the location, and their take-out business is also quite healthy. I ordered a glass of Chianti, and M. ordered a glass of white wine to go with our meals. 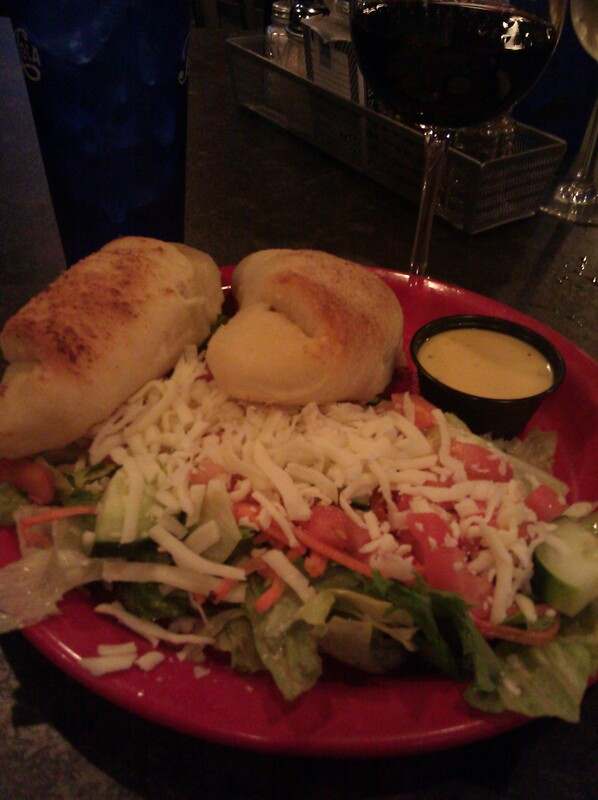 I started off with a side salad – and gave M. one of the enormous breadsticks so I wouldn’t fill up too quickly. 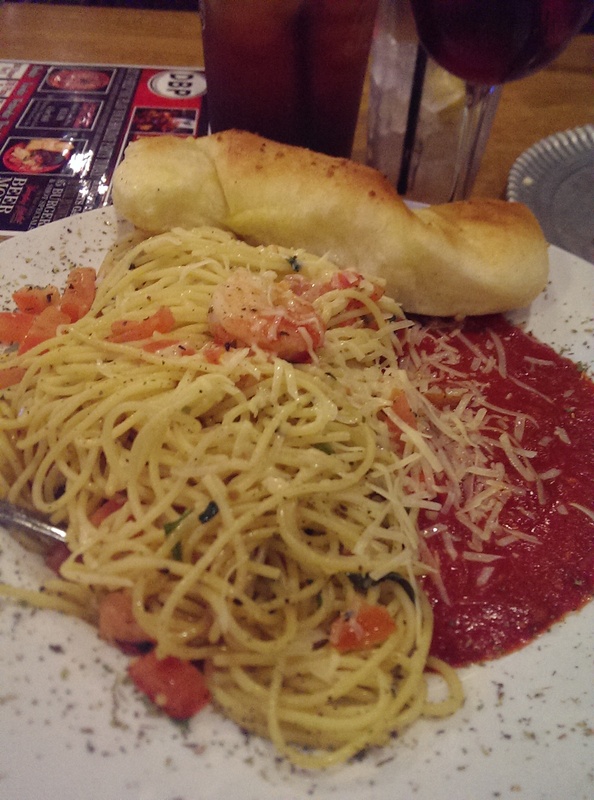 The breadstick was light and airy and had a nice garlicky/parmesan taste to it. I quickly regretted the decision to give the second one up, but only for a brief second when the table next to us got their subs. M. ordered the mac-n-cheese pizza and added onions and mushrooms to it. 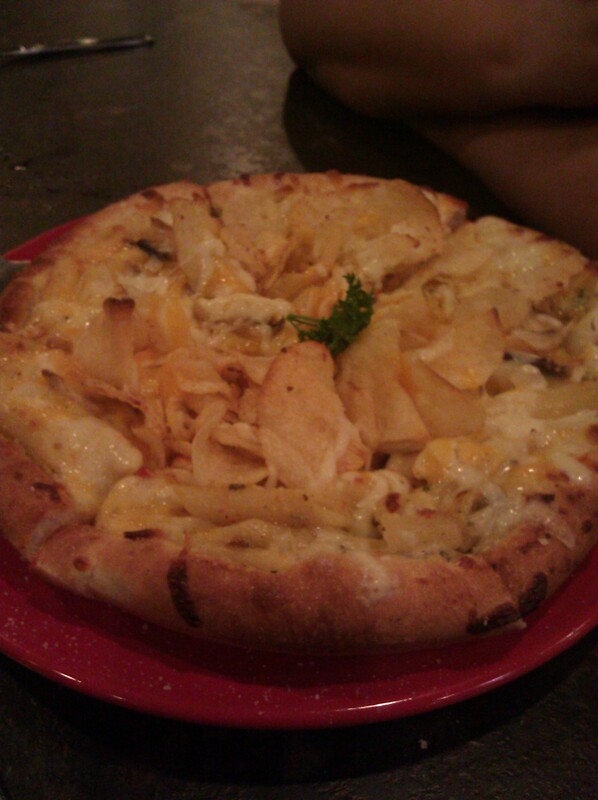 The mac-n-cheese pizza comes out topped with crispy kettle potato chips. The Downtown Mac-n-Cheese features macaroni covered with a Danny Boy’s three cheese blend topped with “kettle chips for a creamy and crunchy delight!” The pizza was amazing. The mac and cheese on its own would have pleased M., but putting it on a pizza crust and topping it with potato chips really elevated it to something special. Carbs on top of more carbs, but what a meal! 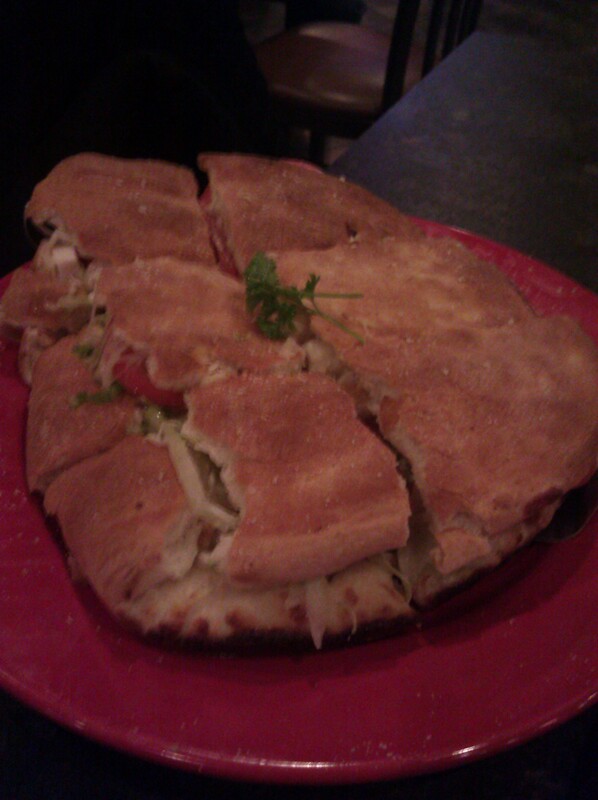 It was delicious flavorful, and I was happy that M. shared a slice with me. She was THRILLED and can’t wait to come back and get it again. I in turn gave her several slices of my pizzas to take home to her boyfriend, who was working that night. 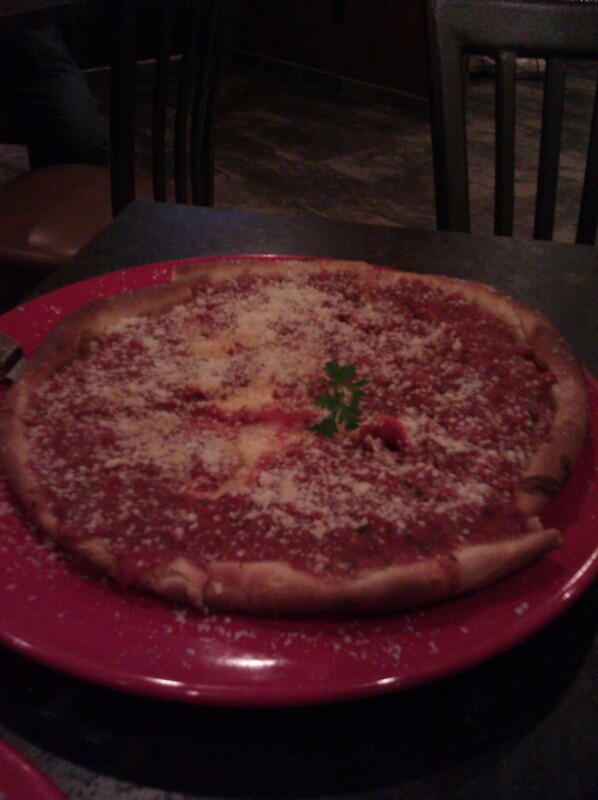 I decided to order The Clevelander, which is a mixture of a Chicago-style deep dish and a thin New York-style pizza. If I had been in the mood for a more traditional Italian pizza with red sauce I would have been more than happy with this pizza, which is one of their award-winning pizzas. As it was, I was in the mood for something lighter, so I also ordered the Chicken Fold Over. When I was a young girl my family would occasionally order a chicken fold over from the local pizza joint in town. The Danny Boy’s chicken foldover was just as good, if not even better, than Uncle Al’s in Olmsted Falls. The fold over features cubes of breaded chicken breast and pizza cheese baked golden brown and topped with crisp lettuce, tomatoes and cool mayo. I was in heaven, and had several slices of it this morning for breakfast. 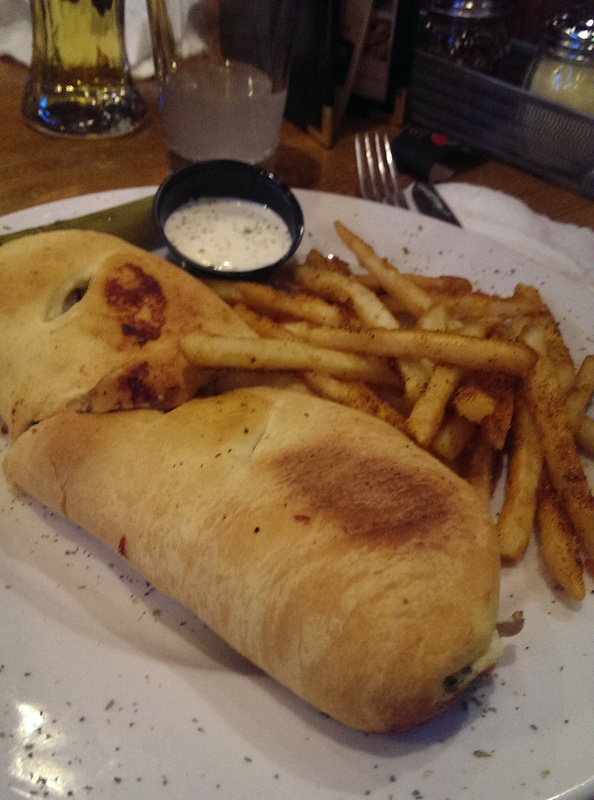 Danny Boy’s has been so successful that it has locations in Boardman, Broadview Heights, Canton, Chesterland, and Sandusky in addition to the flagship restaurant in Rocky River.